Re: Captain McConnell Says "Clear the Skies"
Under the authority demanded of me on page 9.1.1. of the Flight Operations Manual, specifically bullet statement 4 "The Captain WILL make the FINAL decision as to whether the aircraft may be safely operated." I deem it impossible to comply with the requirement of 9.1.1. until any captain can know, without a doubt, that QRS-11 is not embedded on his particular jet. In my experience, Northwest Airlines has always put safety first regardless of the costs. I suggest our company can address this issue and be the first airline in the world to be declared QRS-11 cleansed. The potential risk of not determining the existence, or lack thereof, of a threat may facilitate a second 9-11 style incident. The body of evidence supporting my concern is established and vast. I assure you my interests are in keeping with the interests of NWA. I believe we can use this as a competitive advantage, however safety must come first. I am going to suggest that ALPA and IFALPA considering "standing down the fleets" until this possibility is resolved. On 9-11 an order was given to "clear the skies". I ask ALPA to consider issuing that order again within 72 hours if independent discovery cannot identify the threat. PS: I wish to allow NWA to have this information prior to ALPA being advised no later than 1000 on 12-11-06. I am at 218 329 2993 or 218 498 2568. Notes to "Captain McConnell Says 'Clear the Skies' "
"The State Department charges against Boeing relate to the export of jets that contain a gyroscopic microchip called QRS-11, used as a backup system in determining a plane's orientation in the air. Though a Boeing document refers to the chip as "relatively unsophisticated" technology, the gyrochip also has been used to help stabilize and steer guided missiles. In the draft charging letter, the State Department's Directorate of Defense Trade Controls alleges that between 2000 and 2003 Boeing broke export control laws in shipping to China and other countries what was then classified as militarily significant technology. Further, it claims the company did so deliberately and repeatedly even after it had been warned to stop. "False statements" Boeing "was aware that a [State] Department export license was required but chose to export without authorization by using false statements on documents," the charging letter alleges. Boeing managers declared on shipping certificates that no export license was required, even after the State Department had told the company otherwise, according to the letter. Boeing eventually acknowledged to the State Department it had exported 96 aircraft and 27 spare gyrochip-equipped flight boxes without export licenses. 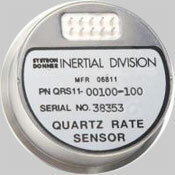 The QRS-11 chip, made by a unit of BEI Technologies in Concord, Calif., is just over 1-½ inches in diameter and weighs about 2 ounces. It sells for between $1,000 and $2,000. Described as "a gyro on a chip," it is used to help control the flight of missiles and aircraft."